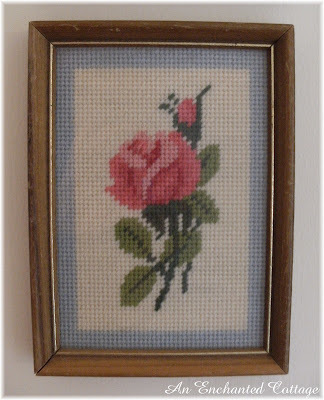 I first found this small framed pink rose needlepoint several years ago in a second hand store in Somerville, MA. 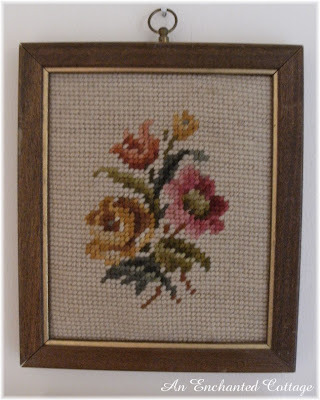 Lovingly crafted by different hands, stitched in different colors, and mounted in different frames; but somehow they were meant to find each other and live happily ever after on the narrow strip of wall between the bathroom door and linen closet of our little cottage. 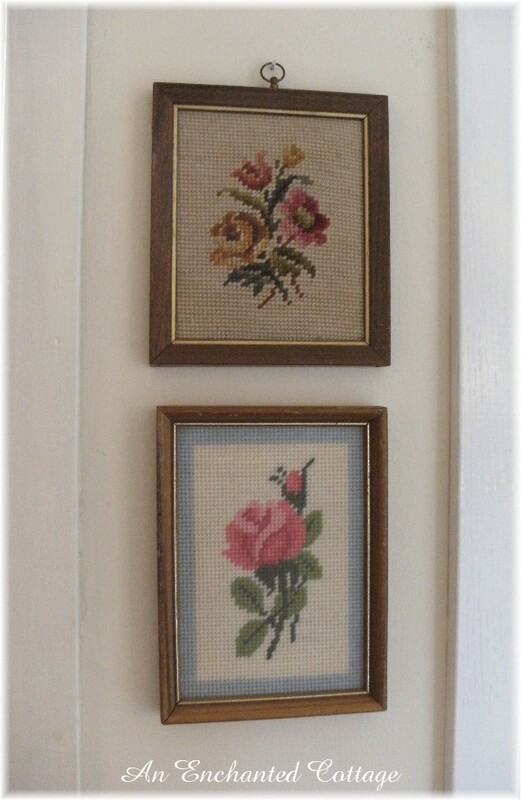 Thank you to the two lovely crafters who put their hearts and souls into these two vintage needlepoints. They are lovely and I cherish them! Be sure to stop and see Cindy at My Romantic Home for a list of all the Show and Tell bloggers participating this week, and to see Cindy's special Show & Tell post! P.S. It hit a high of 97 degrees Tueday. Wilting weather for sure! Mid 70's are forecast for the rest of the week... Heaven! How cute they look together. Great find. Don't you love when you find things at different places and times yet they just go together perfectly. Wow! You are going to be having one hot summer if that's what it's like already out there. Don't you love it when that happens??? The picture of the rose caught my eye in Susan's sidebar. I have one just like it. In fact, I think I have both of those! I don't do needlepoint myself, but certainly (like you) appreciate the hearts and souls of those who have crafted them! Hi Donna; OH how pretty they look together. You are so right that they were meant to be.... great find..
Oh my I know I shouldn't complain but I really hate the heat. I am completely happy with weather in the 60's. What lovely needlepoint! I can appreciate the work that goes into those beauties! I love little needlepoints. Just enough to brighten a little space without overwhelming it. A while ago, I did two different, yet matching needlepoints (tiny topiaries made out of grub roses) for our foyer. It was very satisfying to finally fill that spot. Such a great find to treasure! They are the prettiest pair even though bought separately!